Each of those top-level links goes to an appropriate node page. I have a vocabulary for Categories (multi-level), and I need to get those taxonomy terms in a sub-menu under the "Categories" item. I'd like to avoid hard-coding the items into the main menu, as the sub-menu should grow/shrink as the vocabulary does. In the past I've written over-elaborate code to accomplish this, which hooks into taxonomy operations and manages a particular menu's sub-items based on that (very similar to what Taxonomy Menu does, but without having to have a different menu for each vocabulary). While that method works, it's not ideal and certainly not generic. I can't just lift that code from the old project into the new one, it would require a reasonable amount of customisation. I can't help feeling there must be a 'standard', module-based solution to this. I've seen some suggestions out there to use a bunch of different modules in combination (even some suggesting to use Views-based modules, weirdly enough). I'm open to any suggestion, but if it involves installing more than 1 or 2 modules, and a load of hard-coded, context-specific configuration, it's probably not going to help too much in this case. Option b) I have done something reasonably similar to this on my site, I used Menu Views module, to allow me to put a view into my primary menu. Menupoly has an API for custom "menu tree sources". I have never really made use of this for something other than menu links, so there might be issues we have to fix on the way. But the basic architecture is there. Use your existing main menu, without any taxonomy term links beyond the "Categories" page. Create your taxonomy tree independent of that. Write a custom "menu tree source" that fetches from menu_links as normal, but when it finds a taxonomy term, it fetches from taxonomy instead. So, somehow you need to be able to detect that the "Categories" link is taxonomy-related. If a menu link is taxonomy-related and at the same time has a regular submenu, you need to somehow mix the two types of children together. This route would be some work, but it might be useful for others, and it is probably more elegant and reusable than your site-specific logic. Currently not even a taxonomy-only "menu tree source" exists, so maybe that would be a reasonable first step before starting with a mixed plugin. Metro Menus will do your requirement and even it have the built in skins and can create your own which act same like nice menus. 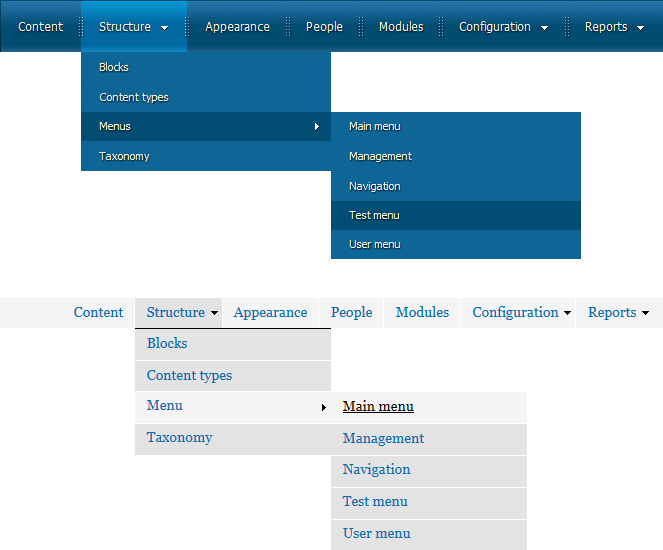 With this module you can select any sub items with any depth from menu or taxonomy and I'm not using this before. Compatibility with touch screen (iPad, iPhone and etc.). You can use Om Maxi menu module for the same. It will allow admin to create menus with blocks you want as attachments, modules like views, slideshow, menu, user, nice menus, quicktabs, and custom blocks with tables, lists, images, videos, etc. You can create a separate menu using Taxonomy Menu and can attach this menu as sublinks to menu generated by om maxi menu. I have recently done something similar for a product category menu. This was only for 1 level deep, but could easily be modified to show further levels. The get_category_menu function is better off as a block, but shown here as another function in the template.php for convenience. Hope it helps or is at least a step towards a solution. How to create submenu based on content type and taxonomy? HIde taxonomy menu based on count? Possibly using rules? How to show children terms of parent terms in taxonomy? How do I sync taxonomy terms with the second level of a menu?